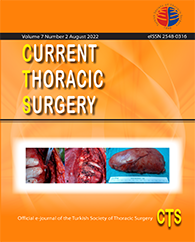 The Current Thoracic Surgery is a current periodical, peer-reviewed and open access official e- journal of the Turkish Society of Thoracic Surgery which its funded and published three times annually. The Current Thoracic Surgery publishes articles in branches of general thoracic surgery, thoracic disease and thoracic surgery anesthesia. The Current Thoracic Surgery is dedicated to publishing clinical research, clinical analysis, laboratory and experimental studies, editorials, invited current reviews, case reports, interesting images and “How to Do It” papers. Being a peer-reviewed journal, the manuscripts sent will be evaluated by consultants and should be appropriate for the current version of common rules indicated for biomedical manuscripts as defined by the International Committee of Medical Journal Editors (ICMJE). 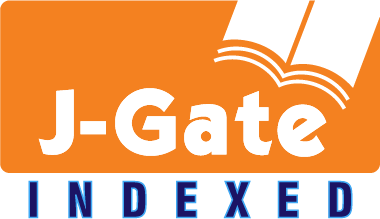 The Current Thoracic Surgery is indexed by the Index Copernicus, J-Gate, Google Scholar, CrossRef, Türk Medline and the Turkish Citation Index.